For many years I never worried about balancing pH or even what my water profile was when brewing. After all, the beer was fine and most of the time I was brewing with extract, so pH did not matter much. However once I started all grain brewing, the water I brewed with suddenly started to matter. It also helped that I moved to an area with extremely hard water, which forced me to use bottled water to produce anything reasonably resembling beer. It turns out that the pH of your mash has a huge impact on the mashing process as well as taste of your finished all-grain beer. Pure water has a pH of 7.0, which means that it is neither acidic nor alkaline. If you are into chemistry, this means that the free H+ (hydronium) ions are balanced with the OH- (hydroxide) ions giving equal concentrations capable of forming H2O. If water has an excess of H+ ions, we call it acidic (lower pH), while an excess of OH- ions gives us alkaline (higher pH) water. Now it we take our pure water in the form of rain and run it down through the atmosphere and soil it picks up CO2 and Calcium from the soil, these elements will bind with the H+ ions leaving a bunch of free OH- (hydroxide) ions making our water more alkaline. This increases the pH of the water. Most tap water is slightly alkaline for this reason. Really hard water can be highly alkaline. Interestingly all malts (and dark malts in particular) have phosphates in them that react with the calcium and magnesium ions in alkaline water freeing up H+ ions that make the mixture acidic. Adding malt, especially dark malt, lowers the pH of the malt water mixture in the mash. The pH of the mash is very important for proper conversion of sugars during the mash and also due to its effect on finished beer. Mashing should always take place at a pH between 5.1 and 5.3. However, its important to note that we are talking about the pH of the mixed mash, which as I point out above depends on the color and quantity of malts added to the beer. In most cases the mixed mash will be slightly alkaline (pH above 5.3) and require an acidic addition or buffer to bring it down to 5.2. Though some commercial brewers can accurately predict the pH of their mash in advance, few homebrewers have the detailed knowledge and data available to do this. The problem is that the color, quantity and even type and supplier of the malt can change the pH. In addition, your starting water and its interactions with the malts may vary with each recipe. Remember that commercial brewers brew the same recipe every time using the same ingredients, while homebrewers do this only rarely. That’s why homebrewers are reduced to measuring the pH of each mash right after it is mixed and then adjusting our pH as early as possible in the mashing process. Measuring pH can be done in several ways including pH (litmus) strips, precison pH strips and even using an electronic pH meter. 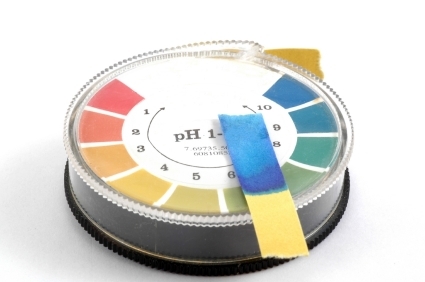 Of the three methods, precision pH strips are usually most cost effective and practical. Standard pH strips lack the precision needed to measure down to a tenth of a point pH, and electronic meters are expensive and require frequent replacement of the electrodes to maintain accuracy. Another practical consideration is that the mash is usually hot, so you need to adjust the pH reading for temperature. Hot wort will almost always provide a higher pH reading than the actual wort. You can compensate for this either by rapidly cooling the sample to room temperature before measuring or applying a correction factor after taking the reading. Check the documentation with your pH strips to determine the appropriate correction. There are several methods available to the homebrewer for adjusting the pH of your wort. As noted earlier, in most cases you will need to lower your pH to reach the 5.2 target level. Calcium and Magnesium Salts: Three salt: Gypsum (CaSO4), Epsom Salt (MgSO4) and Calcium Chloride (CaCl) can be added to lower your pH. The calcium and magnesium ions in these additions reduce the alkalinity of the water. Note, however, that the sulfate and chloride ions react with the phosphates from the mash, which can lead to undesirable flavors. As a result you need to limit the amount added. You can calculate appropriate amounts using a water tool such as the one in BeerSmith. Suggested limits are 50-150 ppm for calcium, 50-150 ppm for sulfate, 0-150 ppm for chloride and 10-30 ppm for magnesium. See our article on water profiles for more information. Food Grade Acids – Acid additions counter the H+ ion and directly lower the alkalinity of the mash. Popular additions include phosphoric acid, sulfuric acid and lactic acid. All of these contribute other flavors and ions to the beer as well, which can again cause problems if used in excessive amounts. Phosphoric acid is used to make soda, and will contribute phosphates to the mash. Lactic acid will add lactates, and is used in many Belgian styles to sour the beer. Sulfuric acid will contribute sulfates. In general you should add the minimum needed to achieve your target pH. The amount will vary depending on the concentration of your acid and wort volume. Acid Malt – Because of German purity laws (the Reinheitsgebot) that prevent additives to German beer, sour malt (called acid malt) is used to aid in the brewing of light beers to lower mash pH. Acid malt is made by souring malt with lactic bacteria for a short period which effectively creates lactic acid. Adding acid malt is effectively equivalent to adding lactic acid to the mash. Adding one percent of acid malt effectively lowers the pH of the malt by approximately 0.1 pH. Sour Mash – Another technique developed by the Germans is to create a sour mash which again contains lactic acid produced by lactic bacteria. The technique is to mash a quantity of grain, cools it to about 80F and then adds some fresh malt (which contains lots of lactic bacteria naturally) and lets the mixture sit overnight. The bacteria will quickly sour the mash and start fermenting it, again creating lactic acid. The next day this sour mash can be mixed with a regular mash to lower its pH. The challenge with sour mashing is that it can be somewhat inconsistent in pH and also labor intensive. Acid Rest – Though seldom used today thanks to modern highly modified malts, an acid rest in the 95F (35C) range can break down phytins in the malt into phytic acid that will lower the mash pH. This was traditionally done in German triple decoction mashes, and is most effective when used with undermodified malts. 5.2 Stabilizer – A number of brew stores now carry an additive called 5.2 stabilizer. This is a powder you can add to the beer to lower the mash pH to 5.2. It consists of buffers that reduce the alkalinity of the mash to reach a 5.2 level. As long as your starting water is not completely out of kilter, this is a good simple solution for many homebrewers. I hope you enjoyed this week’s article on mash pH. Please join us next week on the BeerSmith Home Brewing Blog for another great article or subscribe for regular delivery. Don’t you mean sulfate, not sulfide? Yes – I just corrected it — thanks!! How can i adjust the mash PH if the mash PH is highly acidic. The highly acidic ph may be due to using low PH low. I would recommend some kind of base – the 5.2 stabilizer would probably work well in this case. Does the 5.2 stabilizer go into the wort before the boil? How important do you think it is to also adjust the PH of the sparge water when you fly sparge? The pH of sparge water is much less important than the pH of the mash itself. The mash process is very sensitive to pH, while sparging is less so. Brad- Great article! You said that the stabilizer would be effective as long as your water isn’t out of kilter. Could you clarify this, at what point does your water pH get out of hand, mine is pretty alkaline (around 9.1), will the stabilizer be effective for me? I would personally consider diluting your 9.1 water with some distilled or deionized water to get it down a bit before brewing. Of course, you could try just doing a batch with the 5.2 stabilizer and then check the pH of the mash with test strips to see how far off you are. Great article Brad! If I were to use 10% phosphoric acid to lower my mash ph to 5.2, would it be best to pretreat the strike water or add the acid to the mixed mash? I have a ph probe. The critical piece is the mash itself, so you want to measure the actual mash pH and adjust that using the acid as needed. I’m not sure this is correct. From my understanding, hot wort (ie. wort at mash temps such as 150*) will have a *lower* pH reading than wort at room temps – typically around .35 pH lower. Meaning that if you’re shooting for 5.2 pH at mash temps, you want to really hit 5.55 at room temp. I’ve read wort at higher than typical mash temps (~170*), say for mashout have about a .45 adjustment factor. hello!! great article!! Last time I had to add 120 cc of phosphoric acid to a 240 litre mash (80 kg barley) all grain to achieve 5,5 ph. Is it to much?? it can be toxic? or leave bad flavor? thanks from argentina!!! Hi – 5.5 will not be toxic, and may still make good beer. 5.2 is ideal but plenty of beers are being made at higher pH. It may just not have as good a flavor as it could have! Brad.. reading above, you mention that the mash pH is most important. Also mentioned is that lactic acid can be used to lower the pH. Now, when I go to a LHBS such as Northern Brewer and look at LA, it says it is effective for lowering SPARGE water. I believe I’ve seen that in a couple of searches. Will you help clarify this? My rough Mash Water calculations show it to be 5.44.. I guess, ideally, I’d like to get it a bit lower. Would you suggest using 5.2 to drop it a bit more? I’ve read some discussion on HBT that it changes the flavor.. or add some. If I did add a bit would I still add 1.5ml of LA to my sparge water as my profile sheet shows? I think it’s purpose here would be to try to bring the alkalinity toward zero. So confusing this water..
You can use it in the mash water. You want to use lactic acid in very small amounts however – as it has a sour flavor. Other acids or 5.2 stabilizer are probably a better choice. Seems like the 5.2 stabilizer is the easiest solution. Are there any downsides to this? Any watchouts? Also, how long into the mash is best to test ph? How long do the grains need to steep before ph lowering is complete? I usually test my pH near the beginning of the mash – you want it to be in the 5.2 range for the entire mash conversion. True story, 5.2 Stabilizer will not be effective if your city’s water has a higher pH level like ours. On average, our pH here can range between 7.5 and 8.1. The 5.2 product barely made a dent in the pH levels, whereas a tablespoon of Calcium Chloride brought it down to close-to-earth readings at about 6.3. Not ideal, but not the end of the world either. I’m still trying to get a handle on the formulas that go into factoring pH and understanding safe levels of additives before they affect flavor and all that, but I can at least say from experience that 5.2 Stabilizer doesn’t do jack if your pH levels are high to begin with. I have entered the ions into the water profile tool that I received from the water department. This profile tool will not tell me what my various chemical additions are though unless I set a target profile. That is what I’m trying to figure out in the first place so I know how much to add. How do I determine the best profile for my all grain beer??? I generally don’t go around and point out faults in random blog posts, but this is a rather poorly written article about mash pH with lots of misinformation and since many brewers are reading this and may follow the advice I do want correct some of that information. – Water hardness refers to the Calcium and Magnesium content of the water and does not necessarily indicate high alkalinty. – Mash pH (measured at 25 C) should be between 5.2 and 5.6. Many brewers see 5.3-.5.4 as the optimal range. – mash pH prediction is something I worked on extensively and it is something that’s grown out of the home brew community. The professional brewing community does test mashed to predict mash pH. There are a number of calculators out there that do mash pH prediction fairly well. – The colorpHast pH strips read about 0.3 pH units low consistently when used to test mash pH. We never found out why. Sauermaltz is made by spraying pilsner malt with wort that was soured using lactic bacteria from the malt. The sprayed malt is then dried. The 5.2 mash stabilizer doesn’t work as advertised and adds about 100 ppm sodium to your beer if used at the recommended rate. Don’t use it. Would it be okay to use white vinegar or apple cider vinegar as a pH lowering additive? I found that 2 tablespoons per gallon of my tapwater made it match the 5.0 color on the test strip bottle’s color chart. And if it is true that the test strips are measuring .3 low, that would be the perfect 5.3 right? I agree with Kai Troester 5.2 Stabilizer is not the way to go. Use phosphoric acid or some other method. For anyone wishing to pursue this topic further and treat your water for things beyond just pH, I have a series of posts at my Life, Fermented blog. You can use brewing salts to enhance hop character, malt flavor, ferment health, etc. @ Tom Kilbourn: I would not recommend vinegar. The acid in vinegar is acetic, which has an extremely sharp flavor and low flavor threshold. You would be able to taste it as an off flavor at extremely low concentrations. You can easily pick up some lactic acid at any homebrew supply which has much more favorable qualities (though it too can be tasted, but not at such a low amount). I liked Gordon Strongs interview with Brad Smith. He talked about water prep, very interesting. This polymer just a simple powder and some water you can transform what was a thin solution into something that can stabilize. One very important thing that I never here mentioned in PH articles. You can not adjust your mash water ph to the target of 5.2, then mash in. You will most likely end up with a much lower mash ph and in the end a sour or acidic tasting beer. Nobody ever mentions to new all grain brewers you have to take into account the natural ph lowering qualities of your grain bill. You need to adjust to about 5.8-6ph then mash in (these numbers work for my Midwestern water) and depends on the quantity of higher roasted malts used if any. My ph usually ends up at 5.2-5.6 depending on beer style. For most new all grain brewers I would suggest starting at 6ph, then mash in. Thoroughly blend your grain and hot water (hot liquor) together (doughing in) let it rest for about 5 minutes then take a sample for your ph reading, take another reading before mash out, then adjust as needed for future batches. I also like to check my final wort ph when checking the O.G. Take good notes. I see issues with using both phosphoric and sulfuric acids. Why not use hydrochloric acid to lower pH? I wouldn’t think the extra chloride ions would alter the flavor. What issues do you see with phosphoric acid? If you have enough knowledge to have and issue with it, you should also be able to answer your own question about whether hydrochloric is suitable. Phosphoric is the most commonly used acid to properly lower pH for brewing. I think it has to do with it’s low flavor impact, and that it’s also used for other things in the brewery (cleaning?). It’s also easy to buy food grade phosphoric acid. Food grade hydrochloric might be tougher to find, much less buy, since it has to be below a certain concentration, or you would need a permit. You definitely want food grade acid. I normally scoff at the paranoia about people using gear that isn’t specifically NSF certified to be food safe, since the base materials/plastics themselves things are food safe and used elsewhere in brewing. However, in the case if industrial chemicals, using food safe versions is a prudent choice. Is there any reason citric acid wouldn’t work. My mash ph is at 5.8 and I’d like to bring it down. Could I use tartaric acid to reduce pH in my mash. Starting a brew early tomorrow and have run out of citric acid. I use the tartaric acid for raising acid levels in my winemaking. I would not recommend tartaric or citric acid for beer. I think that lactic, phosphoric or acid malt will serve you better. I used tartaric acid. Worked wonders for me. Cant give you exact amount but the amont of calcium chloride and gypsum added was an elephant as compared to the tarteric acid. I did the test at very small scale. Even after adding the acid it had no false taste at all. So i think the end product will also have no sour taste to it. Caution add the tartaric acid with care or u will end up with very acidic mash. Water was between 8 and 9ph starting in glass. To rice grains sized tartaric acid brought it down to 4 to 5 ph. Thanks for sharing this article. Here is some information about BOD Water Analyzer which is used for water purification.